It might seem taken from a Hollywood movie, but it’s true: many dolphins are trained to work for military purposes. Obviously, this has nothing to do with their normal behavior, but their ability to learn and their intelligence makes them perfect targets to be used by man to achieve specific purposes. The United States and Russia (the former Soviet Union) are the countries that have made these cetaceans authentic soldiers, but it is the American country that has the longest history with this practice. Incidentally, the most commonly used species is the bottlenose dolphin (Tursiops truncatus). b) to study the characteristics of echolocation that allowed them to design efficient methods for detecting objects in the water. Their sense of echolocation makes dolphins perfect for locating objects underwater, one of the main tasks performed by these cetaceans for the military. 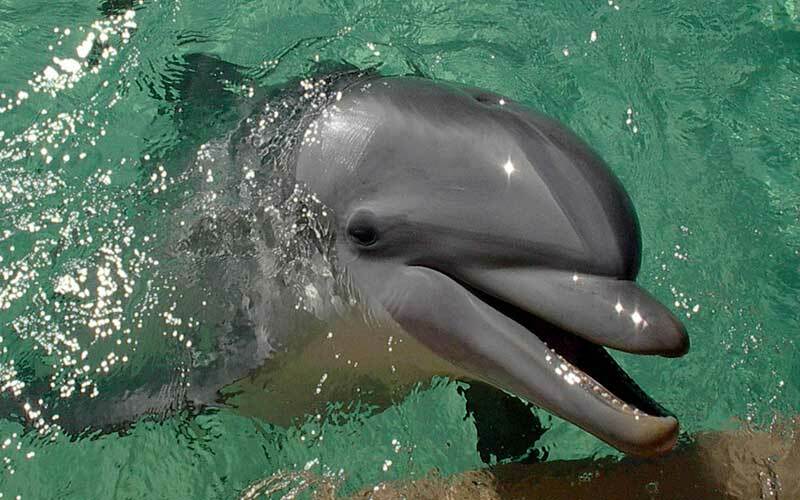 Although the U.S. Navy not only trained dolphins as they also used sea lions (Subfamily Otoriinae) and beluga whales (Delphinapterus leucas), dolphins were especially helpful during the Cold War, Vietnam War, Gulf War and recently In the Iraq war. When they realized their ability to learn and their sense of echolocation, the rest is history. For its part, the USSR made use of the dolphins to perform tasks similar to those of the US Navy dolphins. However, the collapse of its political system resulted in the elimination of the military programs involving dolphins. Those responsible for theses programs affirm that dolphins are the perfect animals for their needs. They are intelligent, can adapt to a different environment and the continuous contact with humans and therefore they are easy to train. Their sense of echolocation makes dolphins perfect for locating objects underwater, one of the main tasks performed by these cetaceans for the military. Their responsibilities are varied, but each dolphin has a particular job, and they do not perform general tasks so while some are trained to detect objects, others learn how to patrol specific areas. – Detection, location, and marking of mines buried in the seabed of shallow water. – Detection, localization, and recovery of lost objects. – Watching ports or specific areas. – Detecting intruders in a limited area. However, some analysts think that they could put mines on foreign ships and they could be used to attack and perhaps kill foreign divers. These last two activities are controversial because although the armed forces deny such activities, some think that it is pretty obvious that they use dolphins in such way. A dolphin named KDog work in the Persian Gulf during the Iraq War /U.S. Navy photo by Photographer’s Mate 1st Class Brien Aho. The ways in which dolphins perform their tasks are fascinating. Their echolocation allows the detection of rare material either from a mine or other object when the “clicks” emitted bounce back in the material and return to them. Tom Lapuzza, a spokesman for the US Marine Mammal Program, says that dolphins can differentiate objects and even distinguish one metal from another. Dolphins trained for attacking humans is a task not admitted by the Navy. Although some analysts think is pretty evident. Dolphins can patrol a zone 24 hours a day every day. If a dolphin detects an intruder in protected waters, the cetacean touches a sensor installed on a boat to alert the personnel and they place a device that produces noise or light on the nose of the dolphin, then the dolphin swims towards the trespasser and touches it with his nose showing the location of the intruder. Sometimes they can also mark it for identification. The mine detection process is similar. When the dolphin locates an explosive, it places around a series of buoys to mark the location. Then, the dolphin or other trained marine mammal lays particular devices to grab the object without any danger. Attacking humans, as mentioned, is a task not admitted by the Navy. But the suspicions arise from an activity in which dolphins are trained to shoot the strangers using a device that could fire a bullet of carbonic acid installed in an injection needle. This weapon, placed in the head of the animal, is fired as it touches the human diver. Do not forget that these are only speculations from some analysts, so far. In return for their performance, dolphins get food. – Dolphins are kept in captivity, away from their habitat and stopping or modifying their natural behaviors as socialization and reproduction. – They are exposed to abnormal conditions to test their adaptability and resistance and to somewhat extreme circumstances. – They are subject to greater stress than in the wild. It reduces their life expectancy. – They are put in danger being in contact with the hazardous materials. – They can easily be a target and eliminated by the enemy as they would be considered soldiers as well. Instead, those responsible for military programs ensure that dolphins are kept in optimal health conditions because they have exceptional medical care and balanced nutrition. However, it is a controversial subject that generates several opinions and organizations like the Whale, and Dolphin Conservation Society (WDCS) oppose firmly. We’ve heard for years that Dolphins are incredibly intelligent creatures. It turns out that they are smart enough to serve in the United States Navy, and have been doing so since 1960 when the Navy decided to study their underwater sonar capabilities to learn how to design better methods for detecting objects in the ocean. The Navy also realized that they could find out how to improve the speed of their boats and submarines by studying how dolphins can swim fast and dive deep. The research ended up going much further than that. Dolphins have been trained to perform several tasks, including delivering equipment to underwater personnel, locating and retrieving lost objects, and guarding boats and submarines. They have been trained to detect enemy swimmers, and this was the case in both the Vietnam war, as well as the Persian Gulf war. The Dolphins patrol around boats and submarines and use their natural sonar to alert their trainers when enemy swimmers are detected. They could even tag the enemy swimmer with a marker so soldiers could spot and apprehend them. 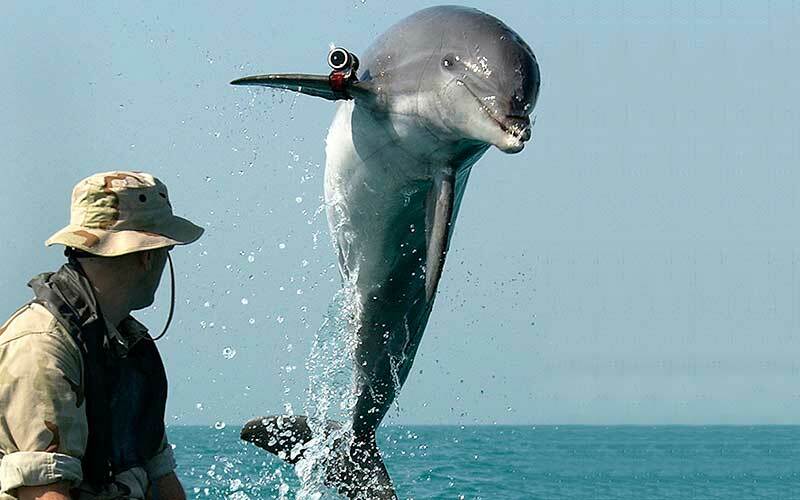 Dolphins even do underwater surveillance for the Navy, by holding cameras in their mouths or attached to the dorsum and have been used to detect and mark underwater mines as well. The Navy began the studies of dolphins in 1960, but the Marine Mammal Program began its first military project until 1965. The first project was called Sea Lab II, and a dolphin named Tuffy was trained to dive 200 feet below the surface of the ocean off the coast of La Jolla, California, to deliver mail and tools to personnel. The Marine Mammal Program has gone through many changes since 1965. From 1965 to 1975, Navy used dolphins in the Vietnam war. During this time, the Navy was steadily building up a team of dolphins, and the program had over 100 dolphins during the 1980’s. With the end of the Cold War, the government reduced the budget for the Marine Mammal Program, however, between 1986 and 1988, six Navy dolphins were sent to the Persian Gulf to protect US flagships from enemy swimmers and mines. They also escorted Kuwaiti oil tankers through dangerous waters. In 1992, the program became declassified. With the cutbacks and the declassification of the program, the Navy explored the possibility of returning the dolphins to the wild but found that this would be a complicated process that would not be economically feasible. The Navy contacted several marine parks but got few requests for the cetaceans. In 1994, they sent three dolphins to a Sanctuary near Key West, Florida. Two were released into the wild by the owner of the sanctuary, without the proper permits, and this caused quite a bit of controversy. Two weeks later, the Navy recaptured the Dolphins and kept the three cetaceans in its facilities, assuming their care and responsibility for the rest of their natural lives. The most recent use of Navy dolphins was during the war on terrorism, in Operation Enduring Freedom. Again, the Navy dolphins were used to guard ships against enemy swimmers and locate and mark mines. The Navy also uses whales and sea lions in their programs. Judith Janda Presnall. I Wonder…Can Navy Dolphins Work for the Army? : Educational Version. Learning Island. John M. Kistler. Animals in the Military: From Hannibal’s Elephants to the Dolphins of the U.S. Navy: From Hannibal’s Elephants to the Dolphins of the U.S. Navy. ABC-CLIO, 2011. Jay Griffiths. Savage Grace: A Journey in Wildness. Counterpoint, 2015.